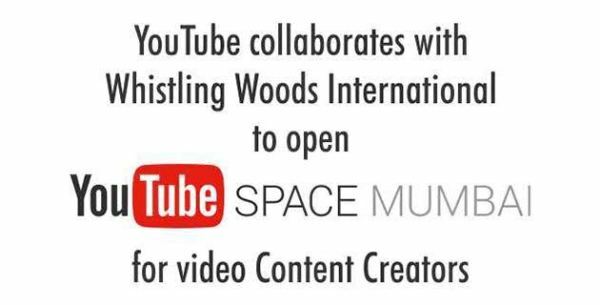 August 19, 2015 (Mumbai, India) — Today YouTube & Whistling Woods International are announcing the opening of YouTube Space Mumbai at Whistling Woods International (WWI), a state-of-the-art collaboration and production facility for YouTube video creators. Slated to open by 2015 year-end, the Space will allow YouTube creators and students at WWI to make better their YouTube content, launch even more ambitious projects, learn about video production, and collaborate with other creators. Located in the heart of Mumbais film & television production hub Filmcity at renowned film school Whistling Woods International, YouTube Space Mumbai is the seventh YouTube Space to open worldwide and the second in Asia, after YouTube Spaces in Tokyo, Los Angeles, London, New York, Brazil, and Berlin. The facilities are designed so that creators can produce original digital video content, all the way from the start of an idea to through to filming, editing, and uploading to YouTube. The Indian creator scene is one of the worlds most vibrant YouTube communities. To support this incredible community of YouTube creators and foster the next generation of Indian talent, YouTube Space team and Whistling Woods International are excited to be partnering with each other. In addition to physical studio space that will be available to students and creators free of charge, YouTube and WWI have worked together to develop curricula to train the next generation of Indian filmmakers to succeed on digital and online media.